How to Remove index.php from URL in CodeIgniter In CodeIgniter we can design URLs human-friendly or seo-friendly. 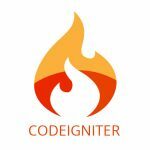 By default in codeigniter, the index.php is added with the URLs. But we remove the index.php from the URL using .htaccess.